This week - 26th April to 3rd May - is Rabbit Awareness Week in the UK. Have a look at the official RAW website for details of some of the rabbity things that are going on this week - there is even a neat little map search facility where you can enter your postcode and see what is happening near you. 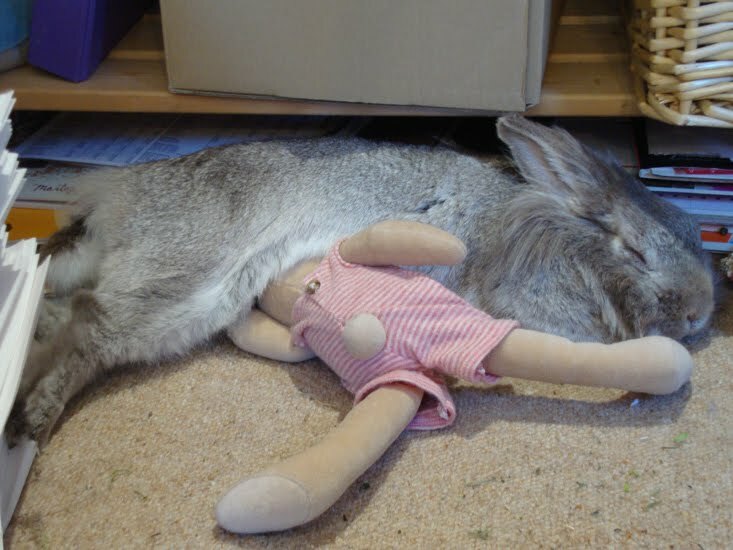 Today I thought I would share a couple of my favourite rabbit websites with you. The first is Rabbit Rehome, a fantastic rehoming site for rescue rabbits. If you are thinking of getting a rabbit please, please, please have a look on here before you visit the local pet store. (Personally I don't think rabbits should be sold in shops anyway). It has loads and loads of information, along with a fully searchable nationwide database of bunnies looking for a new home. And for anyone living in the Midlands I'd like to recommend a fantastic 'rabbit hotel'. Hoppy Holidays is based in Pershore and is run by the lovely Diane. A knowledgeable, caring and kind bunny lover, Diane has become one of my best friends over the years and Hoppy Holidays is the only destination Humphrey will even consider for his holidays! 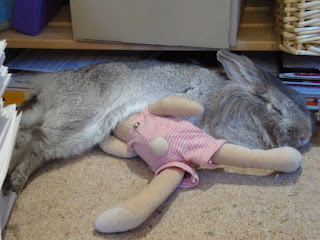 And finally I thought a Rabbit Awareness Week post would be incomplete without a picture of you-know-who... although I have to say that in this photo my rabbit does not appear to be aware of very much at all! Humphrey better move quick or his poor toy will suffocate! Great post, rabbits thank you I'm sure, even if thye don't show it. Humphrey looks so lovely and comfy, so nice of him to demonstrate a shop item. Oh I must blog about this too! VERY important I feel- I can't tell you how many info. leaflets I've photocopied for people who have bought bunnies thinking that they are low maintenance pets! We need more sites like this. On a brighter note- Humphrey is just too cute! I must get snapping more of my two furries- they are such funny little things. thanks for posting about the rabbit rehome! It's how I found my Wesley down at RNGP in Rugby! and for mentioning about pet shops - I look forward to the day when rabbits are not sold in them. Humphrey is such a photogenic bunny. When you hold him, does he kick? He looks so soft and cuddly. I would relish the day that no bunnies or any other little furries (or scaly or featheries) creatures were sold like live toys. Thank you for the reminder. Humphrey looks fabulous stretched out on his toy.